Amazon is cooking up a plan to disrupt the meal-kit delivery business that Blue Apron helped pioneer. Blue Apron (APRN) shares plunged as much as 11% on Monday following news that Amazon filed to trademark a prepared food-kit service. About one-third of Blue Apron's value has vanished since the company went public late last month. Amazon's motto for the new venture -- "We do the prep. You be the chef" -- makes it sound an awful lot like 5-year-old Blue Apron, and similar meal-kit delivery services. News of the trademark application was earlier reported by the Times of London. The Amazon service plans to focus on "ready for cooking and assembly" meals composed of meat, poultry, fish, seafood, fruit and vegetables, according to the paperwork. Neither Amazon nor Blue Apron responded to requests for comment from CNNMoney. The trademark application was filed by Amazon subsidiary Amazon Technologies on July 6, just three weeks after Amazon shocked the food world by striking a $13.7 billion deal to acquire Whole Foods. Amazon's long track record of disrupting traditional business with ruthless price cuts and smarter delivery technology sent a wave of panic through traditional grocery stocks. Now, Amazon is causing some serious indigestion for Blue Apron, which was already grappling with fears of competition in the burgeoning business of shipping boxes of fresh, premeasured ingredients with recipes. Smaller rivals include HelloFresh, Plated and Sun Basket, to name a few. Of course, it's important to note that big tech companies like Amazon file paperwork for businesses that often never come to fruition. 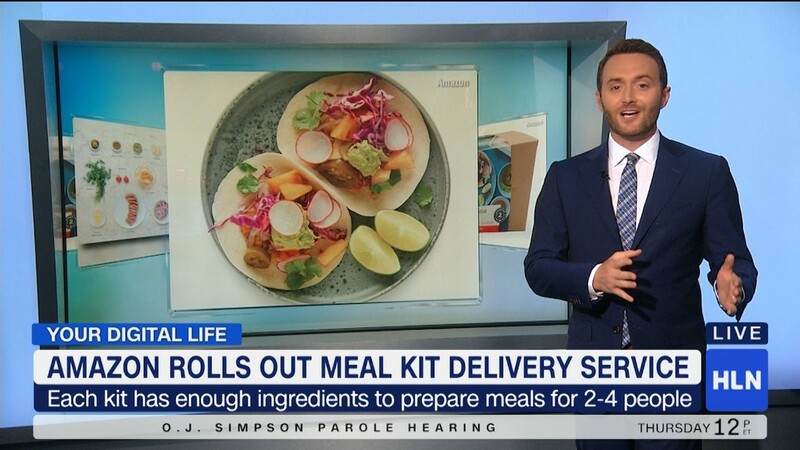 It's possible Amazon will abandon plans to enter the meal-kit business. And even if Amazon (AMZN) does start a Blue Apron clone, there's no guarantee it'll catch on. But it's clear that some Blue Apron investors aren't waiting around to see what Amazon does next. Concerns about competition forced Blue Apron to take the rare step of slashing its initial public offering price before going public on June 29. Now Blue Apron stock has now plunged even below that trimmed IPO Price of $10, crashing as low as $6.51 on Monday. Thanks to the stock plunge on Monday, Blue Apron is now worth about $1.3 billion. That's less than what the company was worth when it operated as a private "unicorn" in 2015. 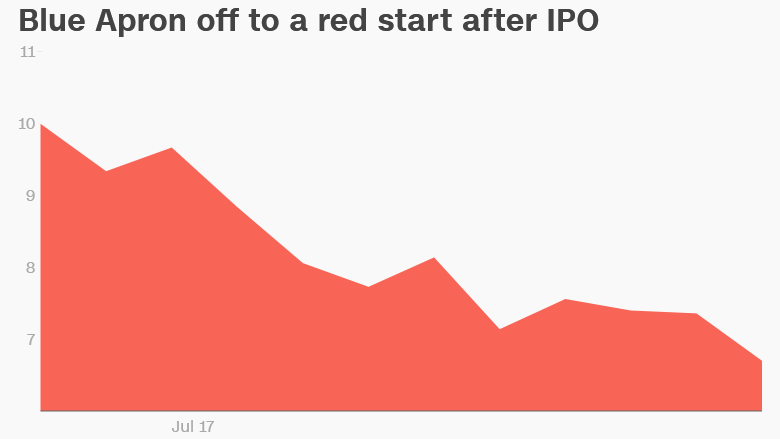 Blue Apron's IPO paperwork seemed to foreshadow a threat from well-heeled rivals like Amazon. "Increased competition presents an ongoing threat to the success of our business," Blue Apron warned in its S-1 filing on June 28. Blue Apron explained that some "potential competitors may have longer operating histories, larger fulfillment infrastructures, greater technical capabilities," more financial resources and bigger customer bases than it does. In another possible allusion to discounting giant Amazon, Blue Apron said some competitors may "adopt more aggressive pricing policies" that could allow them to quickly amass customers.